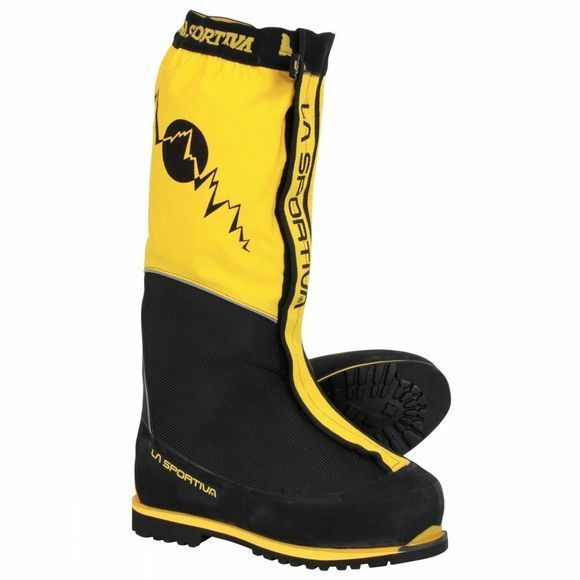 La Sportiva's top-end technical boot for Himalayan mountaineering and the extreme demands of cold environments, the Olympus Mons Evo contains some of the most advanced features in technical footwear production. As you'd expect from a boot built for the most inhospitable environments on Earth, from a world renowned mountain boot maker, the La Sportiva Olympus Mons Evo has some pretty impressive technology involved in its design. The water repellent nylon inner is insulated with micro-perforated dual density foam, as well as a structured polyester pile lining. The outer boot uses breathable Cordura nylon, with microcellular insulation and thermo-reflective aluminium, as well as an insulating footbed. On the outer face, a high, protective, Vibram rubber rand protects against gouges and scrapes (and provides extra friction). Beyond all that, an integrated Cordura gaiter protects against ingress of snow and debris, and is reinforced with Kevlar to guard against crampon damage; the whole thing is sealed with a UV resistant, waterproof zip. Underfoot, a carbon fibre insole with micro-cellular insulation and thermo-reflective aluminium ensures your body heat doesn't dissipate out into the Himalayan rock and ice, and a rigid midsole combines the performance of light, cold resistant TPU and shock absorbing Micropore EVA. Finally, an insulating Vibram sole provides grip as well as being the platform onto which your C:3 crampons can be clamped.